Belthangady, June 10, 2016: It is reported that the Kokkada day care centre for endosulfan victims in Belthangady taluk, which was closed down last month following misunderstandings between an NGO, non-government organisation managing it and the district administration, has now been re-opened. The issue related to want of drivers for bringing victims to the centre. The centre, which was closed down on May 26, was re-opened after three days on May 29. The NGO managing the centre, SKDRDP, Sri Kshetra Dharmasthala Rural Development Project, will manage it with another centre in Alankaru village in Puttur taluk, also managed by it, till March 2017, according to project director. The project director stated that the State government had given the NGO Rs. 1.25 crore in 2011 for managing the centres. The funds had been used up now and the government has not released any additional amount. But it still required Rs. 25 lakh to manage the centres till March 2016. Till then, the NGO would manage the centres from its own resources. If the government reimbursed the amount, the NGO would think of continuing to manage the centres. “We are acting as per our commitment made to the government and in the interest of the victims,” . The SKDRDP closed down the operations of the day care centre in Kokkada after drivers of two vehicles refused to ferry disabled endosulfan victims at the rate of Rs. 18,000 per month. The SKDRDP fixed this rate on the directions of the district administration that found the fare paid for the vehicles far in excess to the prevailing rates. The district administration observed this in April after going through the accounts submitted by SKDRDP that sought additional funds to run the two centres. While asking SKDRDP to recover the excess fare paid to the drivers, the district administration asked it to run the two centres till March 2017 using the money available. The SKDRDP invited fresh tenders for vehicles to ferry victims to the two centres from June 1 and stopped operations of the Kokkada centre till the tenders were finalised. With victims expressing concern over the move, the government made temporarily arranged for vehicles that led to resumption of operation of the Kokkada centre on May 29. However, there was no stoppage of operations at the Alankaru centre as the vehicles continued to operate, though the two drivers working there also opposed to the rate offered by SKDRDP. Fresh tenders could not be finalised on June 1 as the tenders that were received were less than the required number. They are continuing with the services of the four drivers for the two day care centres, said the director. 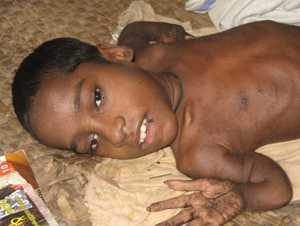 Very sad to see such children suffering from endosulfan. Thanks taking initiative to open a day care center for Endosulfan victims.